The bright and shiny traditional good luck charm that symbolises Children’s Day in Japan has arrived at our hotel… Yay? Whack “Read More” to see what it’s like and a little bit about the real thing. So August is nearing its end, which means the new bunch of Japanese themed furni will likely be making way for something else very soon (although not TOO soon, as 3 days from now the Shibu Ina Puppy limited is being released!) 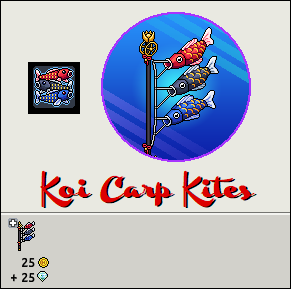 and we’ve seen a lot of stuff – from the cool hi-tech Tokyo range, various attempts at bringing back the old lines by putting a random badge in among some otherwise fairly naff furni bundles, some pretty decent rares in the kitty backpack and maple tree, and now… FISH ON A STICK. Weeeeee look at ’em go. Ok so it is a bit more than a fish on a stick, but this is almost certainly one of the rares that’s about to be doomed to the realms of 5-10c furni. It’s nice, but has no real use and doesn’t reallllllllly go with anything that’s not Japanese already. Out in the real world they’re known as koinobori, literally meaning carp streamer, and they’re used pretty much as cheap and easy decorations for a national holiday known as Children’s Day as carp are apparently particularly spiritual fish. Never spoken to one myself, so I can’t verify that claim. In any case, you can get yourself one of these decorations for the usual 25c+d, and you do of course get yourself a little badge too for those of you who collect such things. They seem to be having fun swimming.